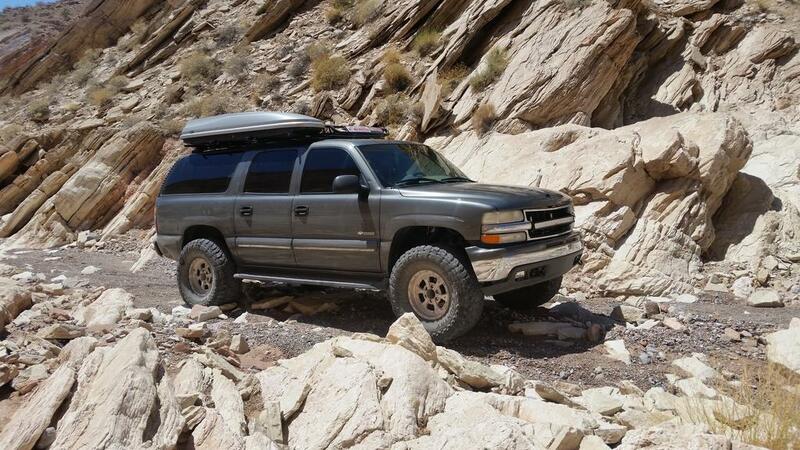 I turned my daily driver and family mobile into an adventure/expedition rig. 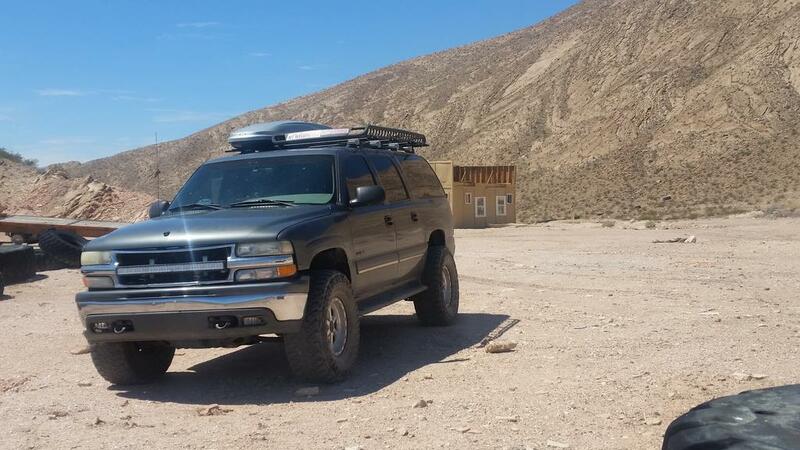 We started out with a 2000 K1500 Suburban and lightly modified it while adhering to a strict $1,000 budget (during the first year) while focusing on saving money on the actual adventure. I live in the Southwest and regularly get out to explore parks, monuments and trails that are close and far. This is a collection of past, present and future adventures. I will try to post adventures weekly to start. 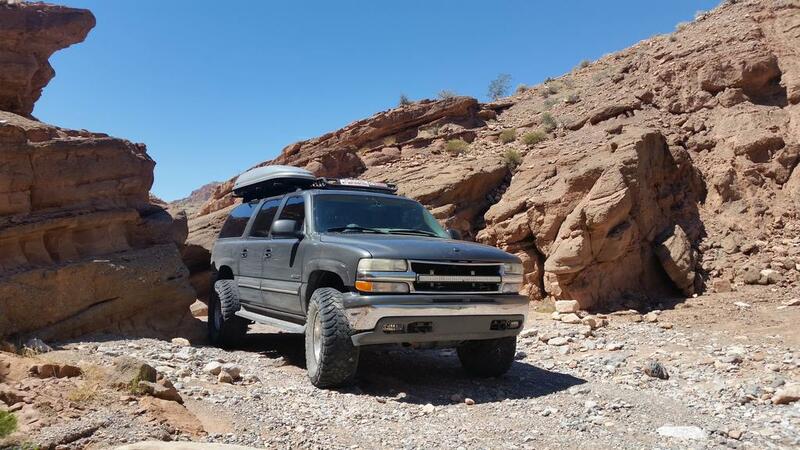 First outing and adventure in the Apex Dunes area after 37" tires went on. 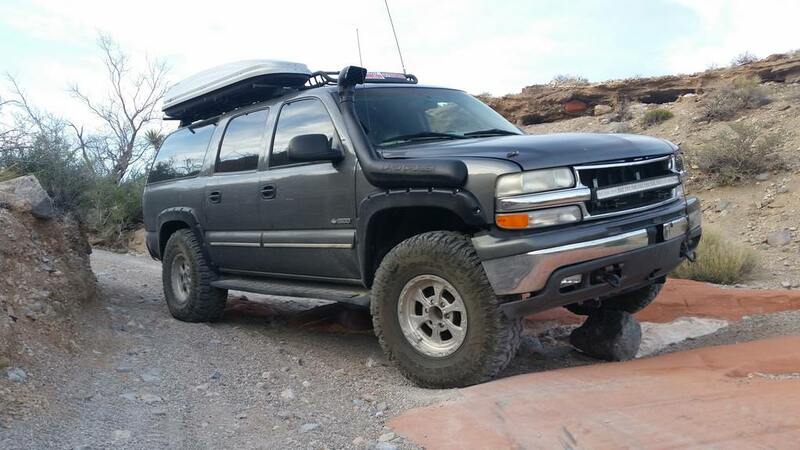 We did approximately 100 miles, 20 miles of "overlanding" through open desert, 10 miles of playing in the sand dunes and 70 miles of dirt trails of varying degrees of difficulty. The truck did well, front rub a little with full suspension articulation, no rub in the rear. 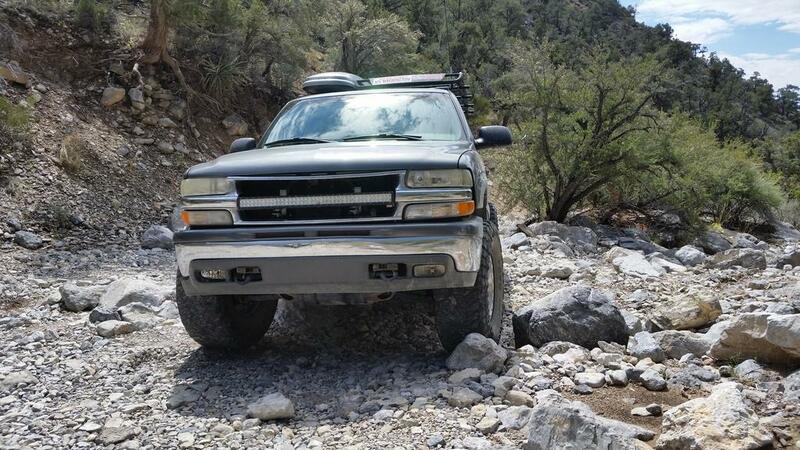 First venture off the trail, 12.5 and 13.5 wide foot print at 35psi kept the truck afloat in the open desert, it rained a few days before the outing and my feet sank 1-2" into the sand every time I stepped out. Truck sank 2-4" into the sand most of the adventure. It went everywhere I pointed it without any hesitations. This was a steep ravine that I dropped into just to see how it handles the more technical terrain. Front right tire sank 8-10" into the sand here, this is where it rubbed with suspension articulation and would definitely rub if I tried to steer. Little bit of fun in the sand, floated great with a wide footprint. Truck ran great with the big tires and went through every obstacle I pointed it at, couple more tweaks before the next adventure. Got 12" here in the mountains around Vegas, here are some pics. Snow melted and compressed to 6-8" deep, once again just like in the sand and loose dirt my shoes sank in deeper than the truck's tires. It's pretty amazing that I am able to play in the sand dunes in 100degree heat and in the snow in the same week. 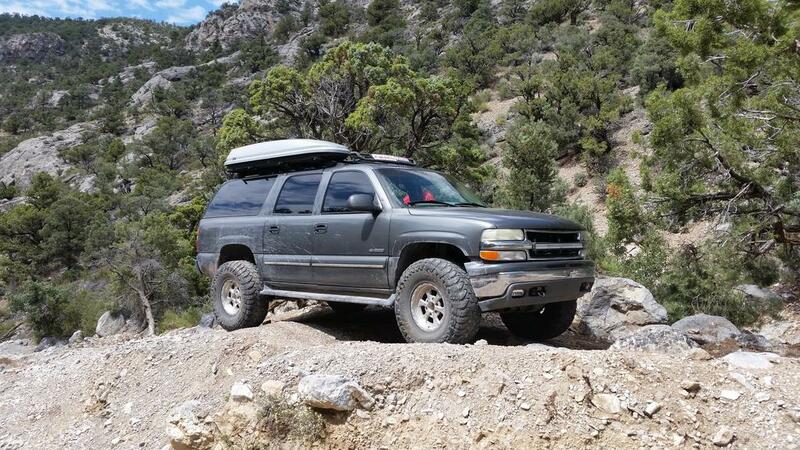 Took the truck up Wheeler Pass Trail in the Spring Mountains outside Las Vegas. 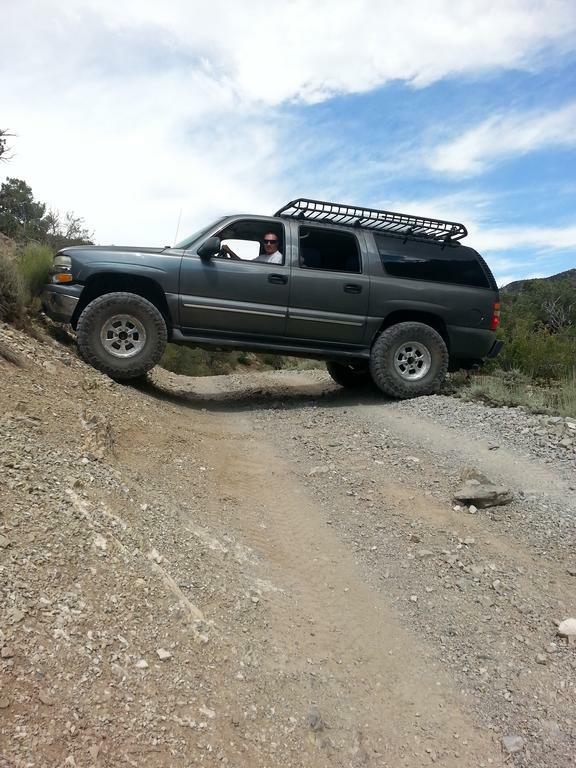 Fun trail, went up the more difficult route from Cold Creek to Pahrump. 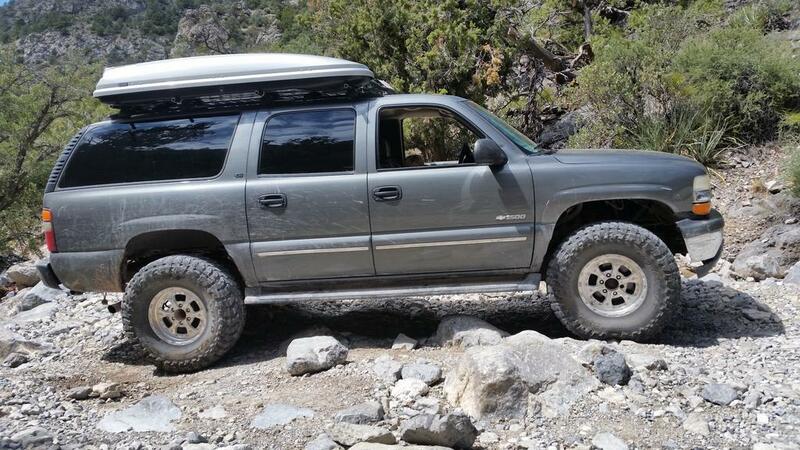 7.6mi to the 7,700ft pass, last two miles was 4x4 low crawling. 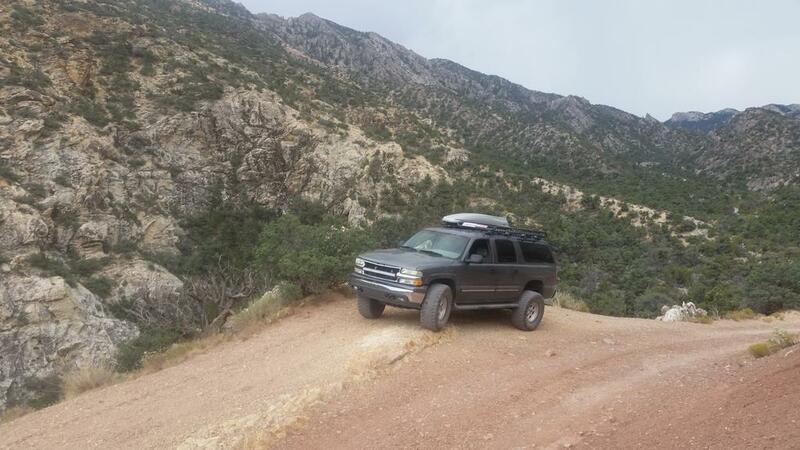 This was the trucks first real trail adventure after getting 37" tires. Entire family had a great time and made me feel comfortable taking the Sub on longer and more challenging adventures. Mother's Day wifey wanted to take the truck out on a mellow trip to see what $600 of parts and constant weekly tinkering is all about. We packed up the 12 year old, two year old and 8 month old and headed out. Kids really enjoyed their personal space in the truck and with the oil shocks the ride was still very smooth even at 35psi in the tires. And dual zone AC worked great. We continued on 800A and then 800 which is Ninety Nine Mine road to the mine and then that cabin. 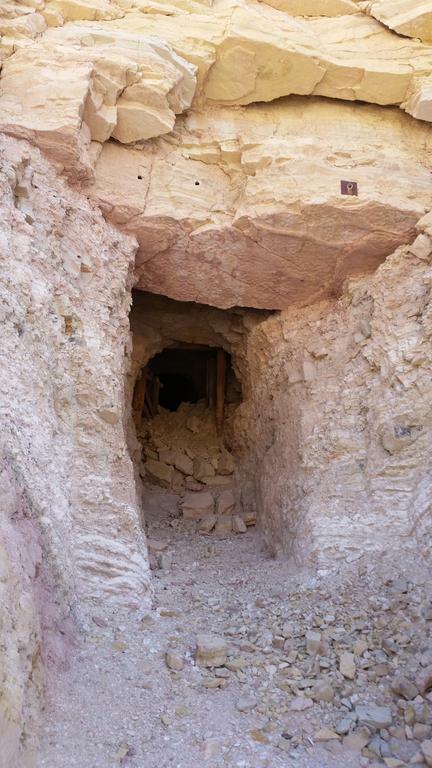 We also explored the Ninety Nine Mine near the cabin, saw lots of 1-2lbs chunks of copper ore everywhere. The cabin was used in 1942 as the base for the Carol Lombard's plane crash search operations. There are two trails that head north from the cabin one to the Ninetynine spring and the other to the Lombard trail and plane crash site which we did not explore based on our limited time that day. After exploring the area we headed back down the way we came up. I did not bring any maps and did not have time to explore alternate routes back to civilization. 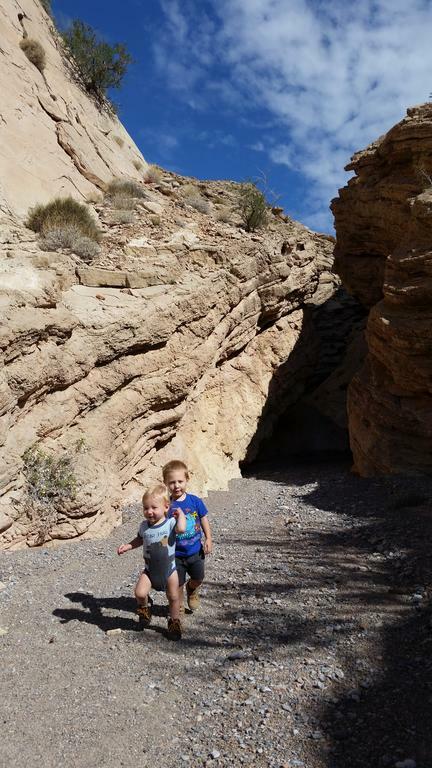 Kids fell asleep with the gentle swaying as we navigated the same rocks and boulders back down. 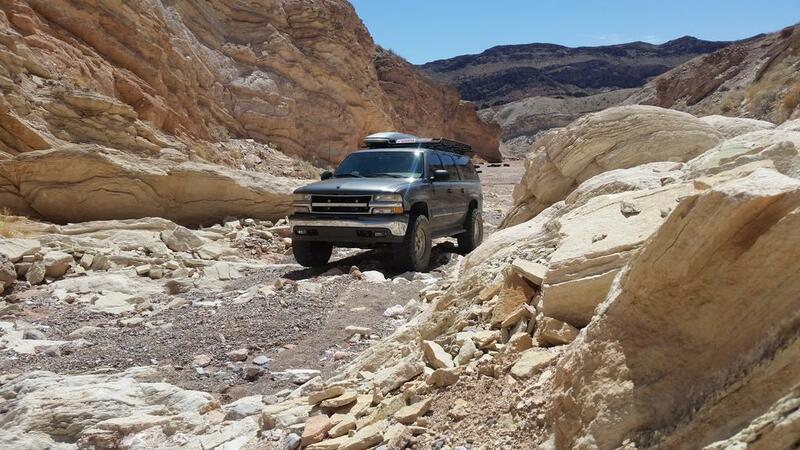 We finished the Cottonwood road trail to Goodsprings and headed back home on paved roads. 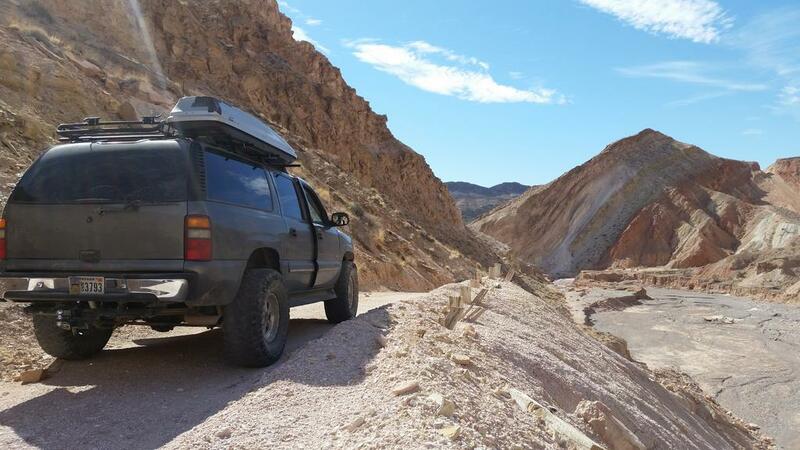 No video this trip, went exploring trails on the north side of Mt Potosi which is southwest of Las Vegas. We started on Potosi Canyon Rd, continued pass the boy scout camp. Potosi mine and explored numerous trails off NFS Rd 582. Ultimately we made it to Goodsprings where I had time to stop by and grab a burger at a 103 year old Pioneer Saloon. Found a small Nevada Department of Wildlife Guzzler. Small volume guzzlers typically benefit such target species as chukar, sage grouse and quail and have one or more 325 gallon capacity storage tanks with an 8x12 foot metal apron.. Fence material is often added to keep livestock, wild horses and burros away from the guzzlers. Took NFS Rd 584 all the way to the end to find a closed off mine as well as numerous sport climbing routes. Saw a wild horse on the way up and down. Tight quarters for a 3-point turn in the Sub but we made it just fine. Continued on NFS Rd 583 all the way to county route 53. NFS 583 is a roller-coaster of an adventure with steep but manageable 100-400 vertical foot climbs and descents. Have to go back again in the near future with the camera. County route 53 brought us to Goodsprings which is the home of Pioneer Saloon. Great trip, lots of fun trails in the area. Finally had a chance to explore El Dorado Jeep trail the other day, and learned how to embed videos!!! 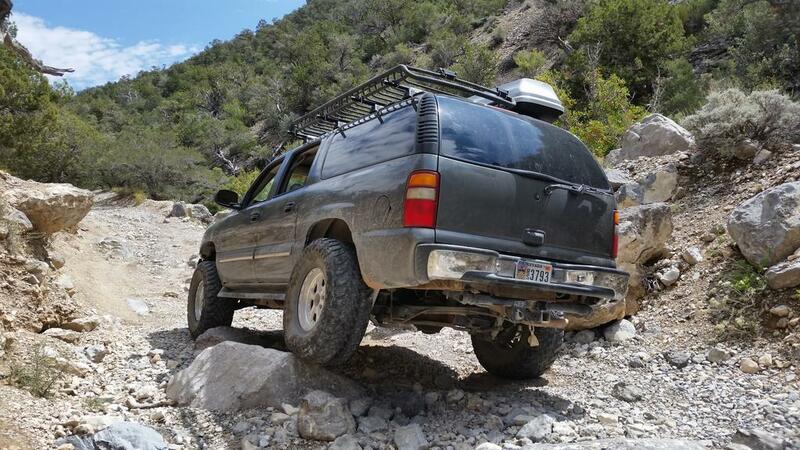 Easy trail, does not require 4x4 or any ground clearance, can probably run it in my wife's sedan. Trail starts around mile marker 24.5 on 93 south of Hoover Dam. First two miles are very well maintained upto Pope Mine, then the actual trail begins. Local outfitter uses this trail for ATV tours and other than washboard its a very pleasant cruise. Found a mine along the way. The end is near the water however actual river access requires a hike which I did not do with the kids this time. Kids had a great time off-road and really wanted to explore the mine however I am not a big fan of exploring abandoned mine shafts. Found a fun embankment to play with suspension articulation. Top of embankment to the bottom is approximately 36", however the pictures don't do it any justice. Did not get any pictures going up but decided to snap a couple on the way down because it felt like the tires came off the ground. Not too bad for 11ft wheelbase. Kids are thouroughly enjoying the rocking and tilting of the Sub as we went down the ledge. There is a little gap between the front right tire and the ground. Pretty cool looking tree on one of the side trails on the way back down into the valley. Fun road I have been wanting to drive for some time now. 47 miles pavement to pavement of Mormon Well Road from Corn Creek SR95 to SR95. 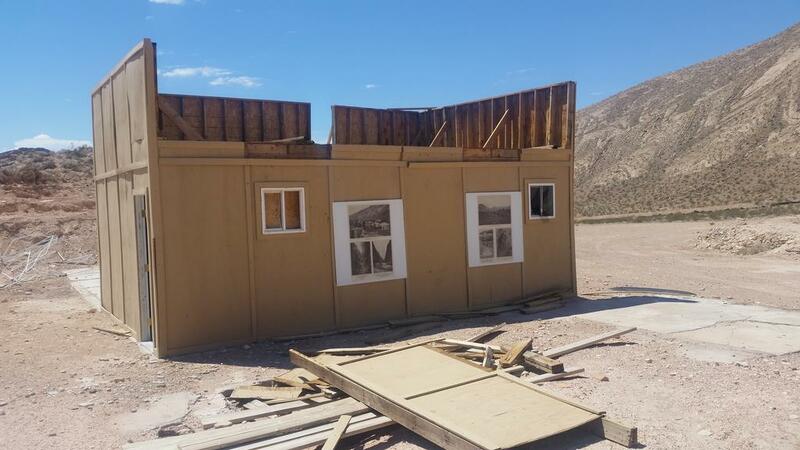 We started at the Desert Wildlife Refuge visitor center which has been rebuilt and greatly improved several years ago with great educational exhibits about the desert. We continued through the Yucca forest, then Peek-a-Boo canyon, onto Desert Pass campground, through Sawmill canyon area to SR95. Fist five miles was washboard, than the road became smoother and much more scenic. Big Horn Sheep at the Desert Wildlife Refuge visitor center and the wildlife we can expect to find along the trail at the Desert Pass Campground. Pretty desert flowers and a lizard that came to hang out with us for lunch. The drive through the Sheep Mountains started out with five mines of washbaord then became really exciting as we entered Joshua Tree forest and continued throught the changing mountainous terrain, however the last five miles coming down the wash felt never ending as we had to watch our speed due to the constant washed out sections of the trail. We packed the truck, hooked up the camper and headed out to Yosemite for a week of rest and relaxation. Tioga pass was closed on our drive up but opened the day before we headed home. We always stay at Tamarack Flat camp ground because it's higher elevation deters whimpy tent campers and a three mile single lane twisty mountain road is supposed to deter RVs and trailers. Perfect place for our little hard sided pop-up. We did get a chance to visit Hetch Hetchy reservoir and hike around it this trip. Both Wapama and Tueeulala waterfalls were spectacular. We also got several quiet hikes in near Glacier Point as well as down in the Valley. We got lucky with our timing, arriving Monday evening and leaving Saturday morning as the 4th of July crowds were rolling in. Entrance to Hetch Hetchy and our spacious spot at Tamarack Flat campground, and yes we were the only camper in the campground. Morning sun shining through the breakfast campfire smoke and somewhere in the picture is the two year old walking through the tunnel tree in Touloume Grove of Giant Sequoias. Standing on top of the fallen sequoia and putting the roof rack to good use by collecting firewood outside Yosemite Valley for a night long campfire. Tioga Pass was open for the summer! Our setup with the camper and about 1,000lbs of camping gear in the back of the truck and in the ski box. Drive up to the park from Las Vegas took nearly 13 hours going through Barstow, Tehachpi and taking the scenic route from Merced to bypass all the construction traffic. Drive back was a brisk 6 hours across Tioga Pass, with a mandatory stop at Eric Schatz for lunch in Bishop and up and over Guardsman pass to Rt 95. Truck managed to run from Yosemite to Vegas pulling a 2,500# trailer over 7,000ft hills with a struggle while running AC on a single tank of gas. I started with nearly a full tank in Yosemite and the low fuel light just turend on by the time we rolled into Vegas. Trip meter showed ~325 miles with approximately 30 gallons of gas used putting the loaded MPG at 10.83. Google maps puts this trip at 397 miles, and with the same 30 gallons of gas used the corrected MPG is 13.2. Not too bad considering that with the same load I drove to Alaska several years ago and averaged 11.5MPG with 32" tires. 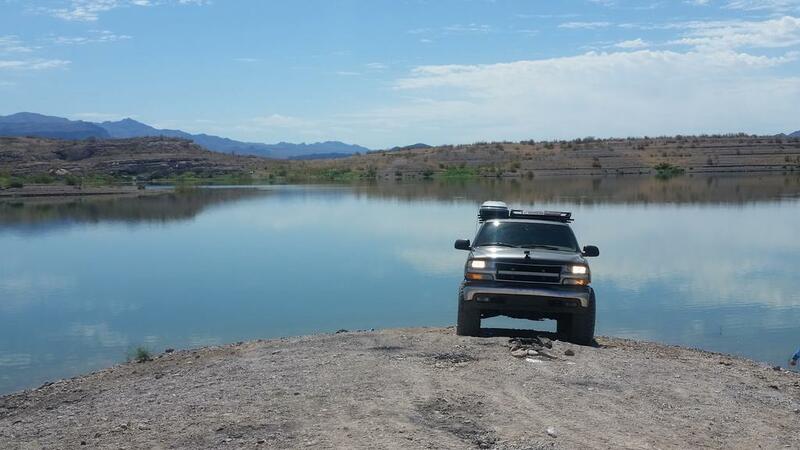 Lake Mead level has been dropping for almost a decade and new areas which used to be underwater are way above water and have been used as locals for great new lakeside camping spots. We explored Boxcar Cove and then ventured to West End Rd, Anniversary Mine, Ore Car Mine and Muddy Mountains Wilderness. Boxcar Cove was a great example of how much water level has receded at the lake. We drove past the areas I used to dive and spearfish in as well as several beaches that used to only be accessible by boat. Currently editing a video of the new trails in Boxcar Cove to be uploaded in the next week or so. We drove up north towards Callville Bay and jumped onto West End road and took the Anniversary Mine Rd cut off. Anniversary Mine is an on-off active mine which closes the trail down to public when outside the park and on private land. Looks like the mine has not been in operation for a while and all the gates were open. Some abandoned structures. This area is where the fuel and diesel tanks for the mining operation used to be. 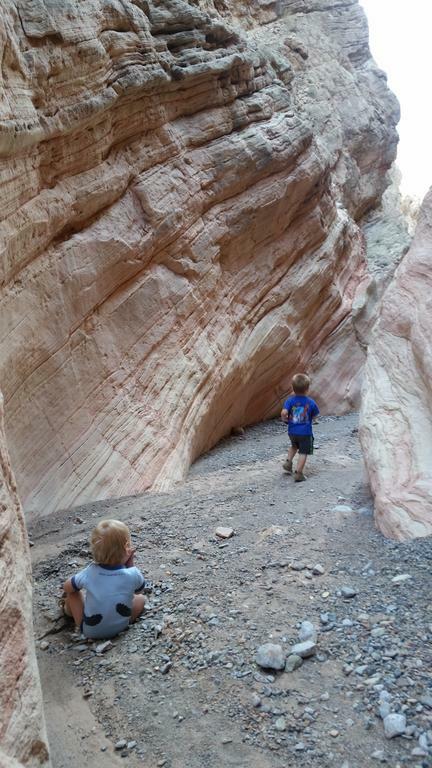 Exploring the canyon below near the mine shaft. 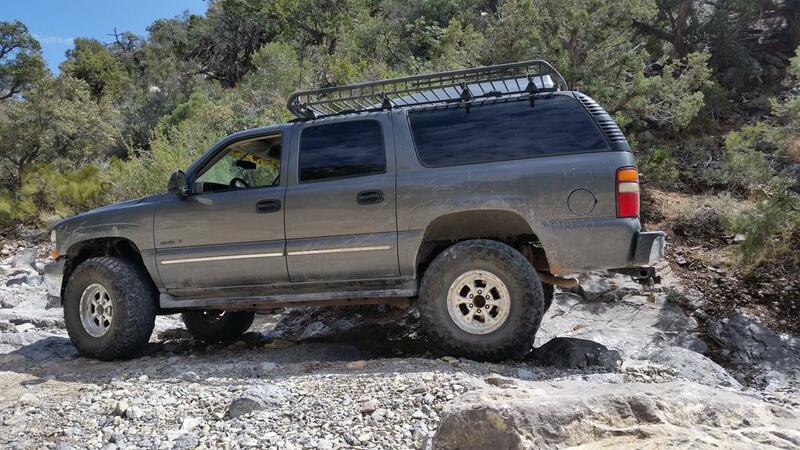 Pretty cool terrain to venture into in 2wd. 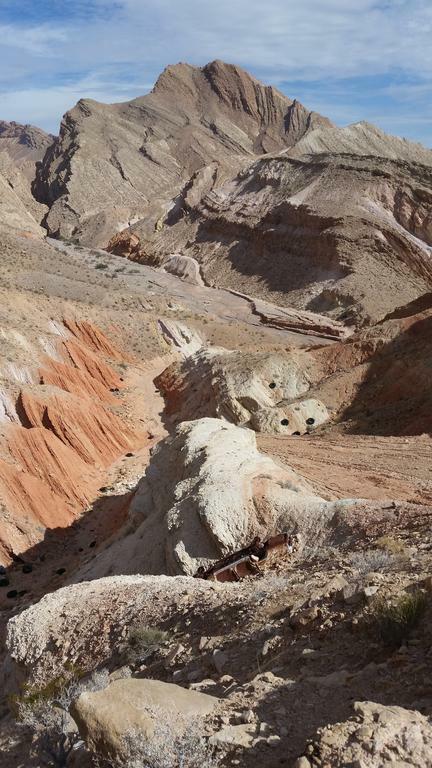 Another shot of the truck at the bottom of the canyon. 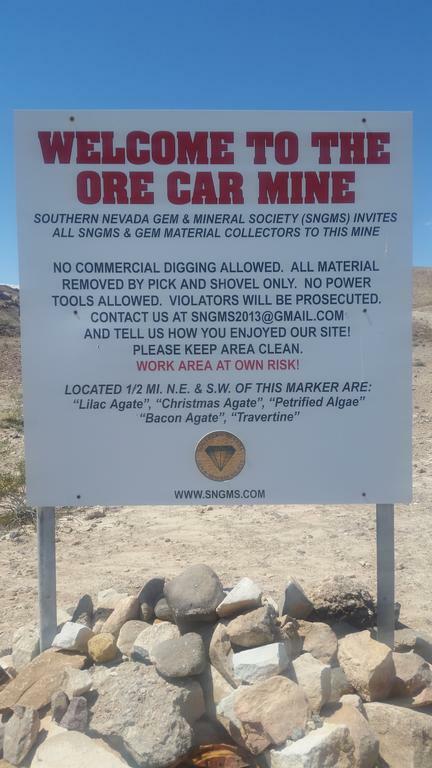 Nevada Gem and Mineral Society has numerous sites around the state where the public can go to abandoned mines and extract gem stones with hand tools for personal use. 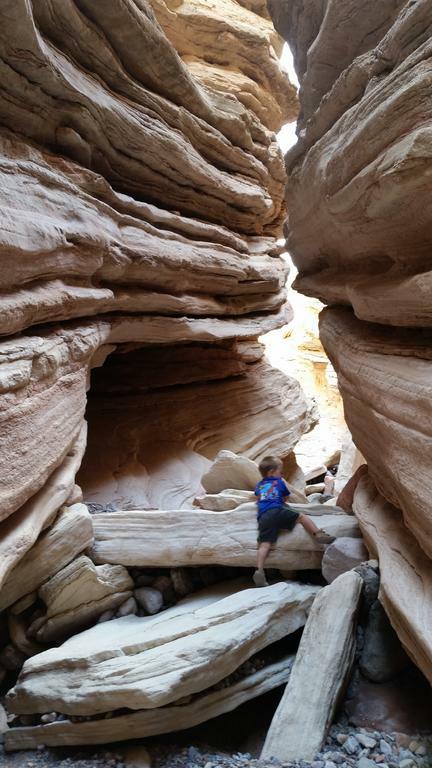 On the way out from the trail I noticed a new area I have never seen before, we drove the trail all the way to the end and found a fun slot canyon 3-4miles in. End of the line for the truck. 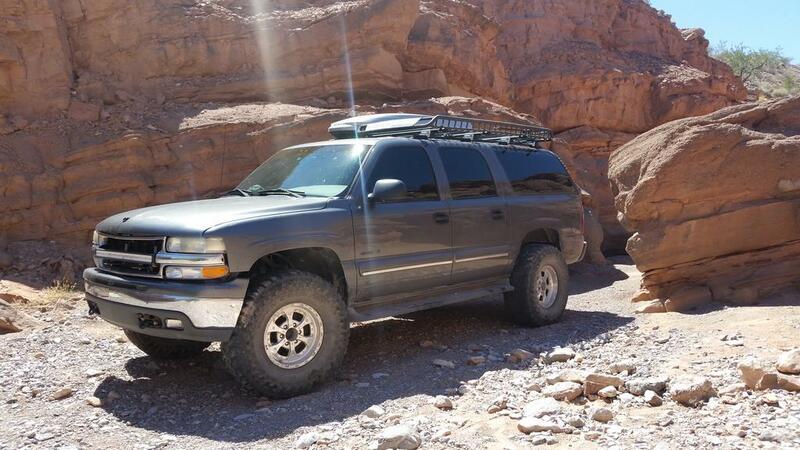 I have done many canyoneering trips however a Suburban is a little too big for slot canyons. 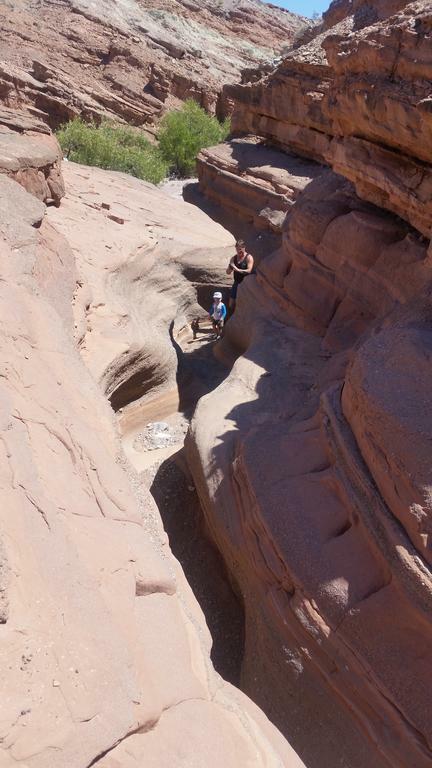 End of the trail, start of the 150ft long mini slot canyon. 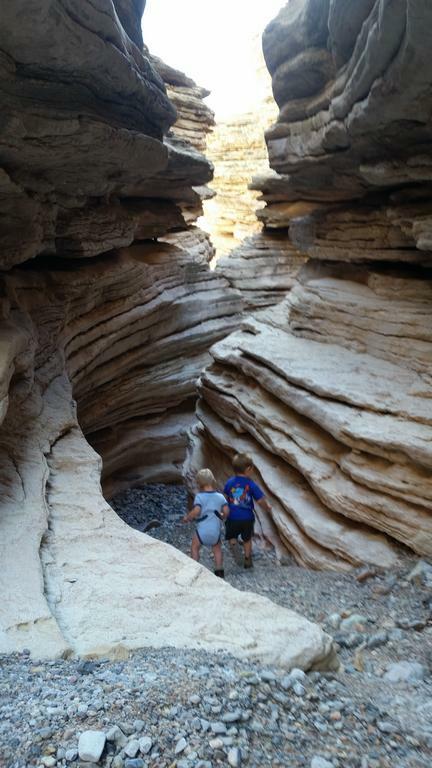 My kiddo and father in law exploring a slot canyon. Great day at Lake Mead, had a chance to visit new areas I have never been in before and explore newly surfaced areas which I have explored underwater in the past. Had some video camera issues and working on the videos right now. Kids woke up this morning asking to go off-road. 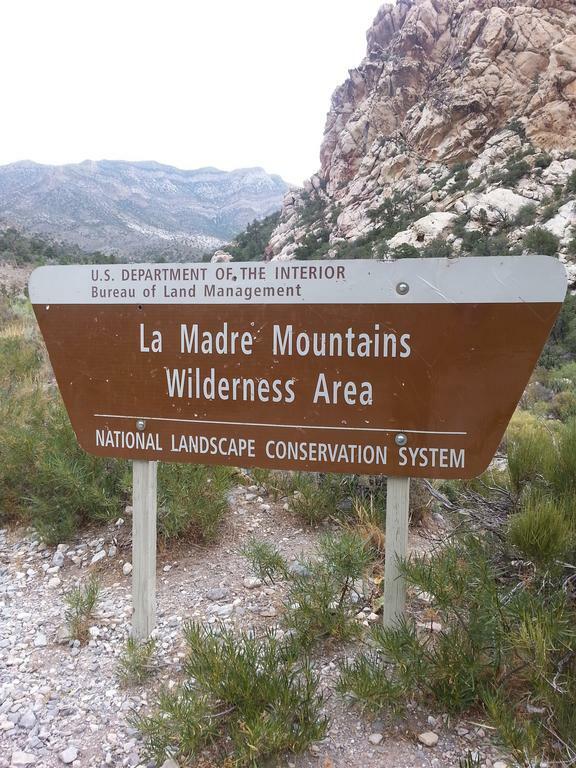 Didn't want to wander too far away from home so we ventured back into the La Madre Mountains Wilderness right in our back yard. 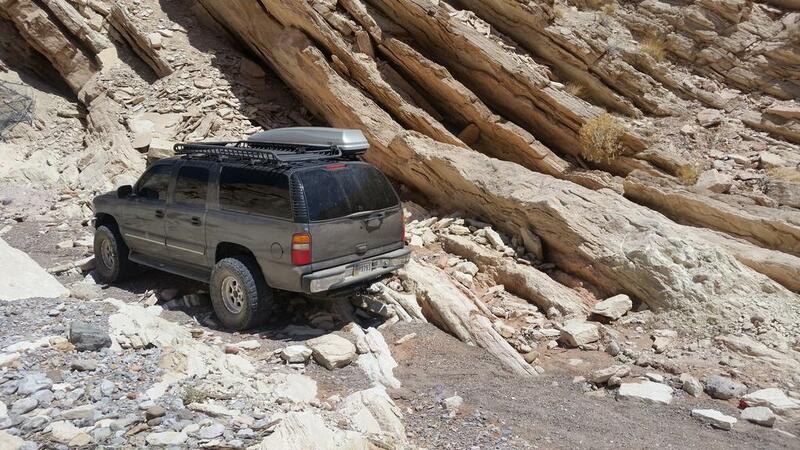 We drove to Red Rock Canyon to explore the trails. Pretty vista where the trail changes from red sand to rocky outcroppings. Fun trails are wide enough for two cars to get by and other areas are barely wide enough of the Sub to make it through. Took a wrong shortcut where the trail ended abruptly and had to turn around, this was the widest part of the trail, and it was way better than backing up 1/2 mile. Best picture of the day. 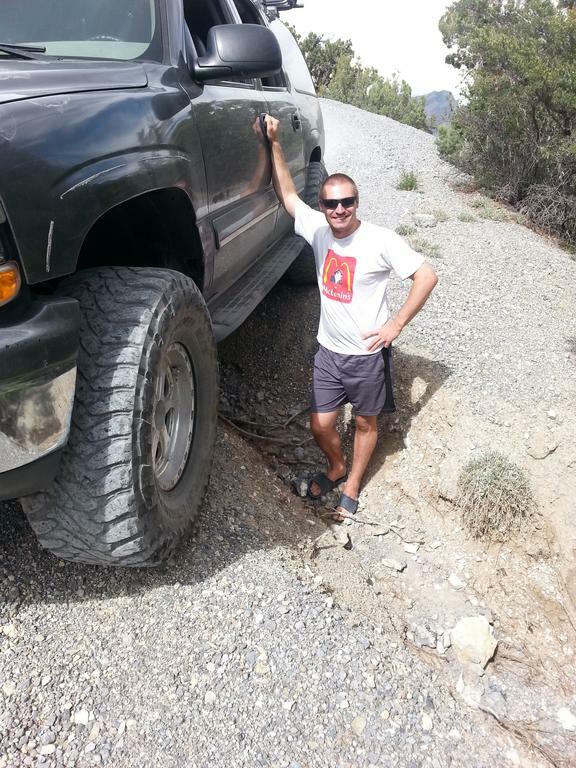 I drove across a 3ft wide 3ft deep washed out section of the trail and jumped out of the truck, optical illusion makes me look like a midget. We ventured out to Rocky Gap Rd trail today. 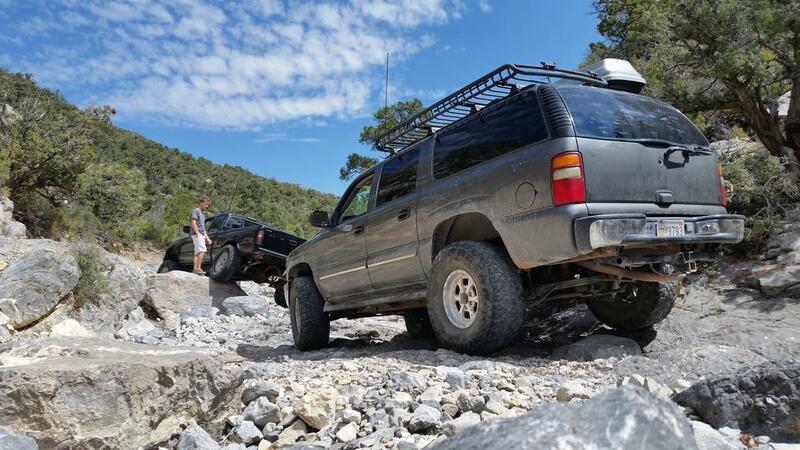 We had two missions: drag my buddies 2wd Frontier to the top and play around in my friend's 99 Tacoma and see what it can do. We accomplished both. I picked the more tame lines through the 1-3 foot high boulders. Found a flat spot on Rocky Gap Rd. 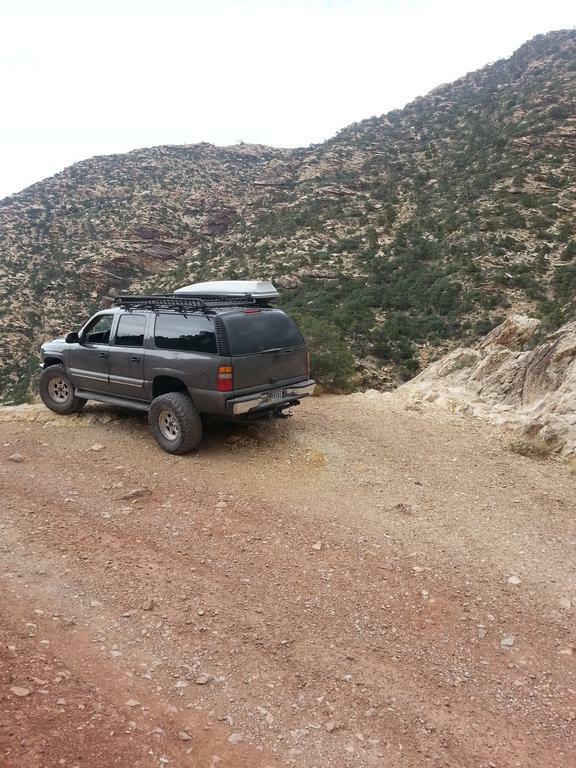 We ended up doing the fun part in 200-300ft sections, I spot the Tacoma, then he spots me. Tight and narrow section with a 4ft drop. I pulled the spare tire off because I have not raised it yet and did not want to snag it or puncture it on the sharp pointy rocks. 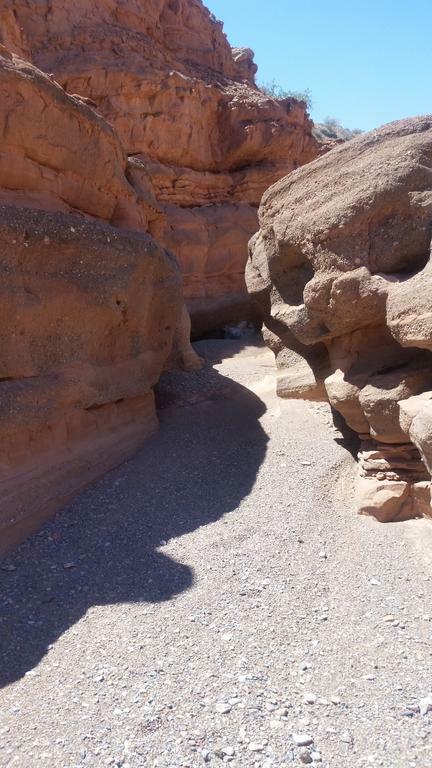 This is a relatively short, easy and fun trail at Lake Mead NRA which starts several miles north of Callville Bay on the west side of Northshore Rd. 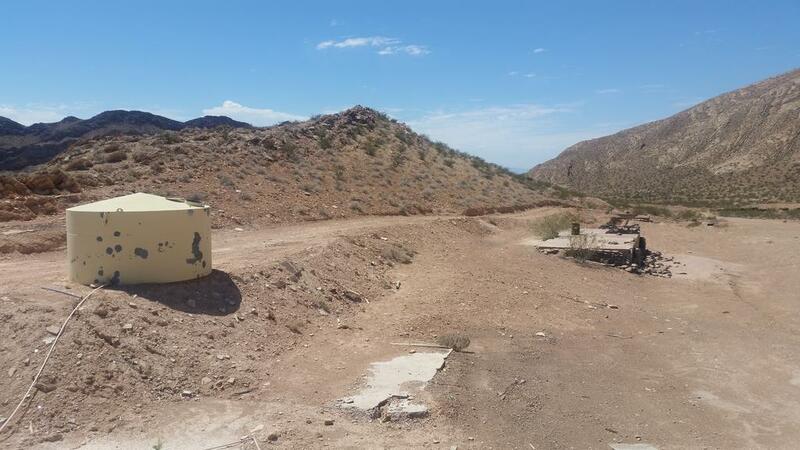 The trail technically runs between West End Rd and North Callville Wash Rd. I started up West End Rd for approximately one mile and turned right onto the Anniversary Mine Rd, followed the trail to the private property that used to be an active mine as late as this spring. There are no gates, fences or signage for the mine. There are remnants of buildings and foundations from the active operation not too long ago. The traditional route into the mine drops into the canyon and follows the canyon up, however with the new mine that route is closed. 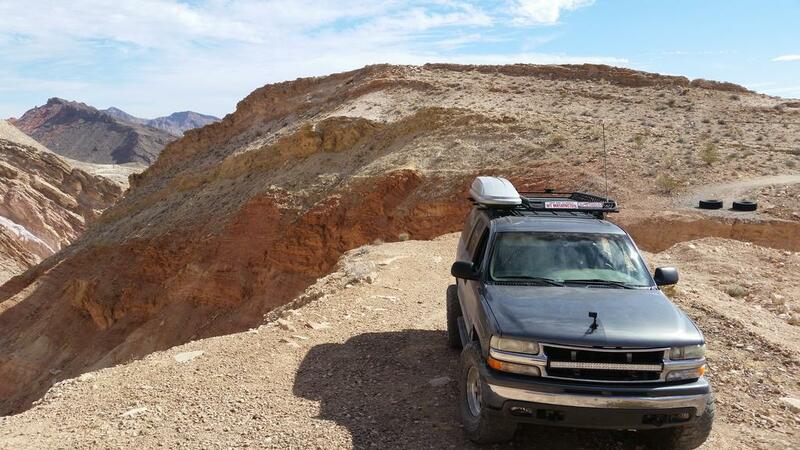 We went around the back way dropping into the wash via a relatively steep 30-35 degree slope, headed up the wash to the Anniversary mine and then onto the narrows. 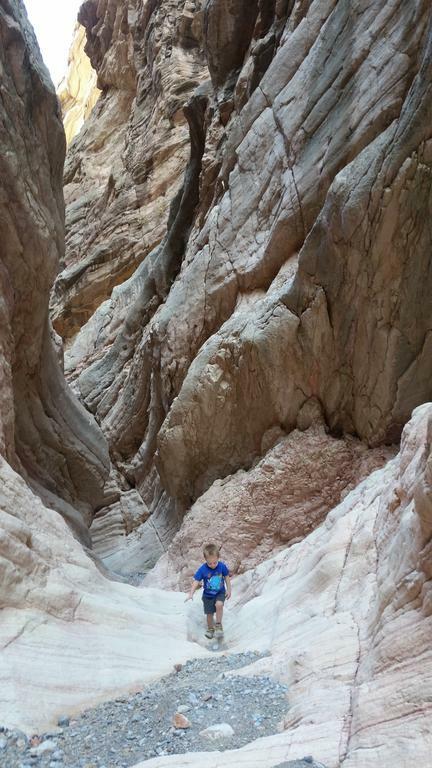 We did not go into the mine however we did hike the entire length on the narrows. Top of the mining operation, the trail we took is on the right edge of the picture. Sub at the top of the ridge before dropping into the wash.
At the entrance to the Anniversary Mine overlooking the wash and the top 1/4 of the steep trail we took to get in here in the top right corner. Entrance to Anniversary Mine, we did not go in. Boys at the entrance of the Anniversary Narrows. 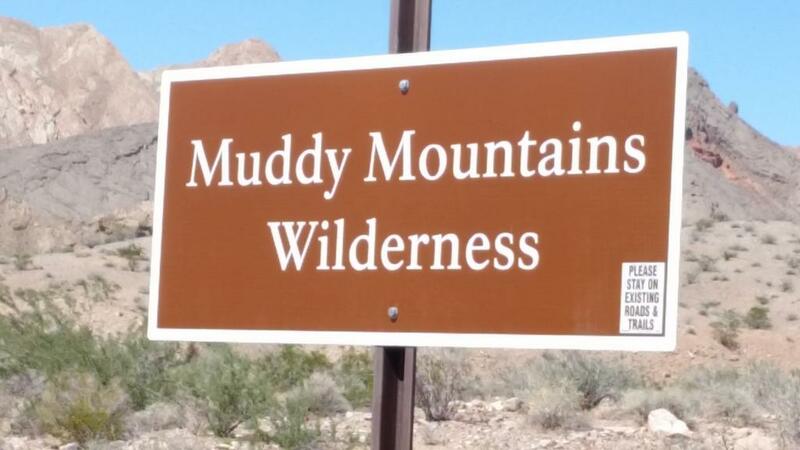 Overall this is a hidden gem that's on BLM land just outside the park that you can only get access to from Lake Mead National Park. Very cool trips. It's nice to see a Suburban put to good use, and to reinforce the idea that they are not just for suburbia.